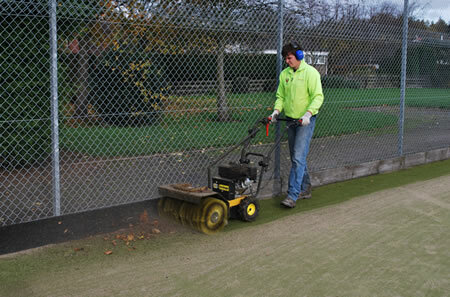 This a mechanically driven power brush which allows operators to clean the perimeter of synthetic pitches and courts. It is a very effective cleaning maintenance machine and keeps the edges clear and de-compacted. This machine is used to keep areas clean all year round. It is an efficient snow clearer, with its specially-developed brushes, this machine can easily clear snow up to 20 cm deep. In the spring/autumn season, we use this machine for clearing areas of dirt, leaves and twigs that collect along pitches and courts.